U.S. Sen. Mitch McConnell, R-Ky., speaks to members of the media after a ribbon cutting ceremony for exit 30 on Interstate 65 in Bowling Green, Ky., on Thursday, July 6, 2017. 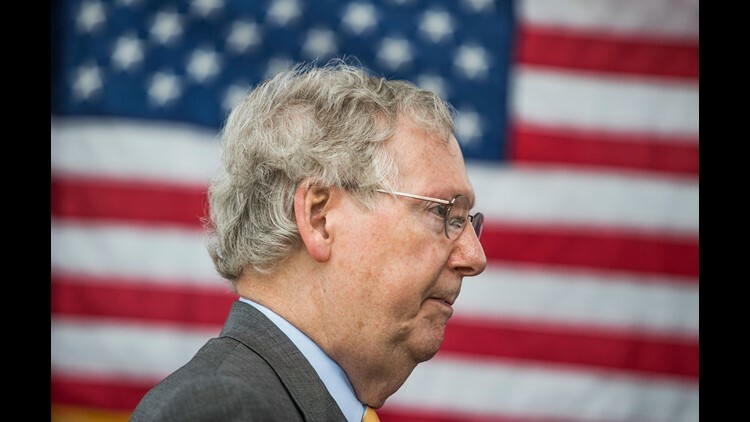 LOUISVILLE, Ky. – Senate Majority Leader Mitch McConnell said Wednesday he won't be intimidated as protesters vow to keep fighting against Supreme Court nominee Brett Kavanaugh. Meanwhile, a political group taking credit for getting into the face of the Kentucky Republican as he walked through Reagan National Airport near Washington, D.C., on Monday said it was a "last resort" to oppose Kavanaugh's confirmation. “How many stories of sexual violence do you need to hear in order to believe women,” an activist can be heard asking McConnell in a video released by the Center for Popular Democracy. The confrontation comes as McConnell faces scrutiny for emphatically backing Kavanaugh amid allegations of sexual assault during his high school and college years. McConnell was unfazed by the women who confronted him, saying on the Senate floor on Wednesday that Republicans' opinions won't be swayed by protests. "I want to make it clear to these people who are chasing my members around the hall here, or harassing them at the airports, or going to their homes," McConnell said Wednesday. "We will not be intimidated by these people. There is no chance in the world that they’re going to scare us out of doing our duty. I don’t care how many members they chase, how many people they harass here in the halls. I want to make one thing perfectly clear: we will not be intimidated by these people." 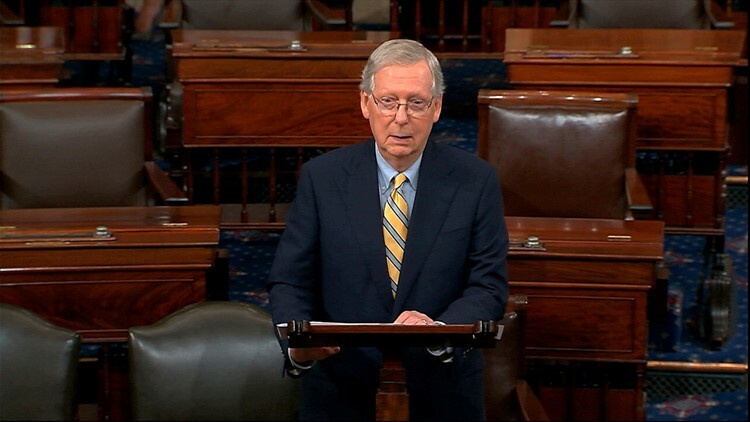 Senate Majority Leader Mitch McConnell speaks about Sen. John McCain on the floor of the U.S. Senate, Aug. 27, 2018, on Capitol Hill in Washington. In the video from the airport, three activists yelled at McConnell as he silently walked through the terminal and then took an escalator to his motorcade. He's seen shaking a man's hand as he dodged the protesters. The activists are connected to the Center for Popular Democracy, a New York-based group that promotes a "pro-worker, pro-immigrant, racial and economic justice agenda," according to its website. Jennifer Epps Addison, the center's president and co-executive director, told the Courier Journal on Wednesday that the women in the video are all victims of sexual assault. “The fact that Mitch McConnell wouldn’t look at or acknowledge a victim of sexual assault but would shake a man's hand as he’s walking through the airport, speaks volumes," Addison said. One of Kavanaugh's accusers, Christine Blasey Ford, said in a testimony to the Senate Judiciary Committee last week that she is 100 percent sure Kavanaugh drunkenly pinned her down and tried to take off her clothes when they were teenagers. Kavanaugh has consistently denied the allegations. Addison said the group has been providing training across the United States to teach people how to "bird-dog" their politicians. In addition to McConnell, they've also confronted Republican Sens. Jeff Flake, of Arizona, and Bob Corker, of Tennessee. She also said they've confronted Democratic senators, including Elizabeth Warren, of Massachusetts; Bernie Sanders, Vermont; Tammy Baldwin of Wisconsin, as independent Sen. Bernie Sanders of Vermont. McConnell was harassed by protesters several times this summer over Trump's immigration policies and migrant families being separated at the border. In June, McConnell and his wife, Transportation Secretary Elaine Chao, were confronted as they left a dinner at Georgetown University. A month later, McConnell was confronted as he left a restaurant in Louisville. He was also forced to leave an Italian restaurant in Schnitzelburg after hecklers blared Public Enemy's "Fight The Power" and yelled, "no justice no peace."